These Trophy Cases that are Made of Acrylic Have Lift-Off Lids! These Display Cabinets are Ideal for a Teenagers Room or a School! Common Size (w x h x d): 12" x 12" x 12"
14" x 14" x 14" 15" x 11" x 11" 29" x 11" x 11" 9" x 6" x 6"
Clear acrylic construction for easy viewing from any angle. Purchase includes a removable riser for displaying any round object. Features a lift-off top for easy access to the displayed items. Includes black acrylic platform to easily blend in with any setting. 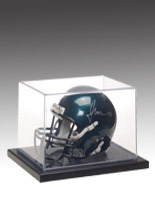 These acrylic trophy cases, also recognized as tabletop display cabinets, are essential for the sports enthusiasts or die cast collector. 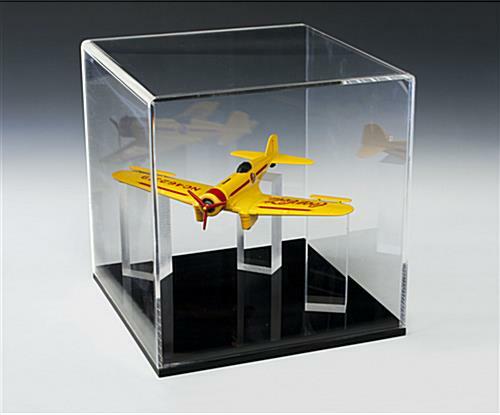 With ample display space, these Lucite trophy cases are usually utilized to exhibit mini cars or limited edition model planes. These showcases that incorporate a lift-off lid allows buyers to effortlessly enter the unit. 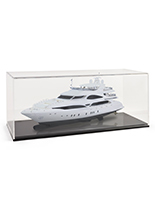 The clear Lucite design of these tabletop displays makes them the ideal trophy case for use in a residence or workplace. 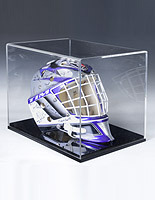 These trophy cases that do not lock are designed for lower value items and are not ideal for displaying high priced items in a public place such as a museum or trade show hall. 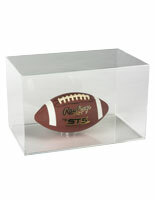 Many other model display cases are sold at this site that would be more appropriate for those uses. 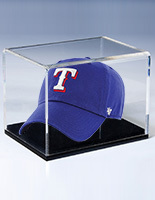 These trophy cases attractively display your memorabilia, while keeping them secure and free from dust. Every product is fabricated from 1/4" thick Lucite and comes with a black Lucite platform base. 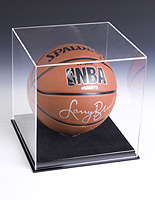 These tabletop display cabinets, trophy cases that use a riser allows buyers to easily display any flat or spherical items. 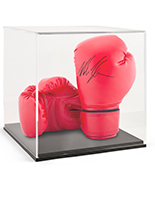 These acrylic displays are usually seen showcasing sports memorabilia, limited edition model cars, hand-constructed doll houses or other kinds of collectibles. 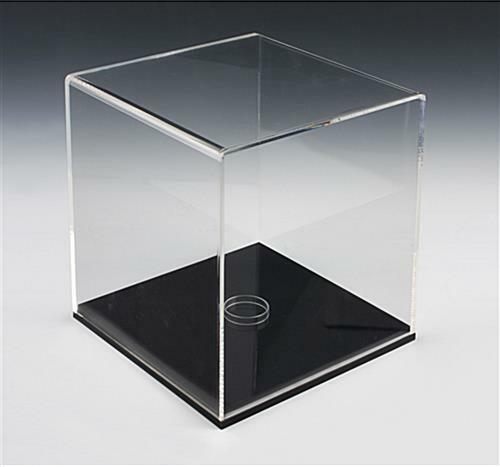 These Lucite display cases, tabletop trophy cases are engineered to shelter your exhibited collectibles from undesirable handling. The neutral design is perfect for use in a great many locations. 12.6" x 13.1" x 12.6"
12.0" x 12.0" x 12.0"